Dr. James Robert Adair was a well-known Irish settler who came to America in 1730. After migrating from Pennsylvania to North Carolina, Adair settled in Dobbs County, now known as Greene County. As a glamorous early settler, writer, explorer and patriot, Adair eventually settled and died in Robeson County. The Robeson-Richmond County Committee of NSCDA-NC dedicated a granite marker to Adair near the site of his home, which was half a mile to the west of Rowland, NC. 500 people gathered for the ceremony honoring the monument for Dr. Adair. Miss Mary Harlee and Miss Jane Alford Rowland unveiled the marker. Both ladies were descendants of Dr. Adair. The monument was placed across the road from where Adair’s home once stood and near the cemetery in which he was buried. 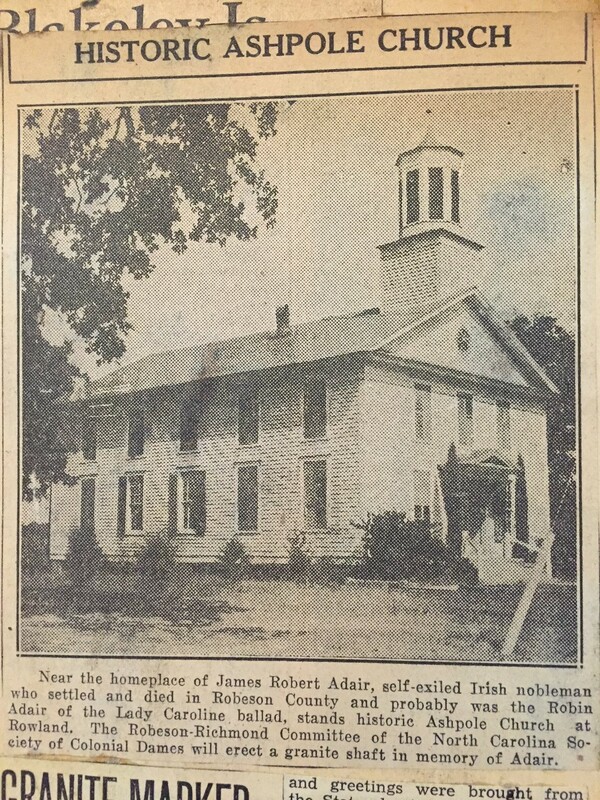 The marker states, “James Robert Adair, M. D., Pioneer physician, patriot and author of History of American Indians, published 1775, London England.” A ceremony at historical Ashpole Church followed the unveiling celebrating the history and achievements of Dr. Adair. The audience heard from many speakers who retold the life of Adair, and the Fort Bragg Band played specific selections for the event.